Symbols*: Salmon are endowed with the power to swim upriver in search of spawning grounds. The journey is arduous and treacherous, but the fishes’ determination can serve as inspiration in the pursuit of goals. They spring through the air, often just avoiding the hungry mouth of predators. They swim against powerful currents and waterfalls. The cups provide guidance along their journey. The currents are continuously moving and represent the changeability and challenging nature of the forces in our lives. Salmon are sacred and represent multiple blessings. From the depths of the tumultuous waters, they reach for their goals and emerge in a placid reservoir at the end of their journeys. Description*: If you remain passionate and focused on your dreams, it is possible to confront and overcome seemingly insurmountable situations. With strong vision and will of spirit, you can make your dreams come true. The challenge of the journey will heighten feelings of satisfaction once you have succeeded in your task. Hardship often precedes true satisfaction and emotional happiness. If we remain steadfast on our journey, the obstacles that we confront may actually facilitate our drive to succeed. Possible Meaning: Three salmons are jumping out of the water, nine cups are on top of the wave, from five of the cups water is spilling. These elements represent happiness. You are or have been on a quest to reach goals, leading to satisfaction. 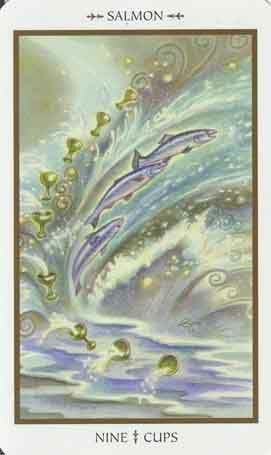 Emotionally you are doing better than in a long time, you have been able to overcome obstacles. You’re determined, and focused. Thoughts/Points to Ponder: These salmon seem to be happy, they’re jumping out of the water to express their joy. This is a very spiritual card, this is about the psyche rather than the physical being. It also represents the intuitive side within me. Salmon – Able to overcome obstacles. Determination. Focused energy. Perseverance.